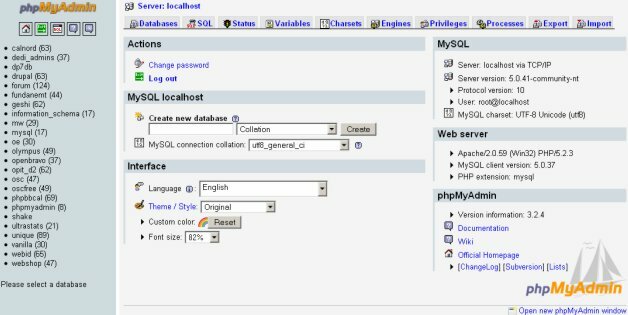 MySQL is one of the most popular open source Relation Database Management System (RDBMS), used very widely developing database based Applications – it’s specifically very popular in web development (The blog – you’re reading right now, is based on wordpress, which also uses MySQL databases for storing contents such as post, category, comments, and other meta data). Since Ubuntu (11.10 beta 2 – latest version, final is coming within few weeks) has now become the most popular choice for application development, LAMP (Linux, Apache, MySQL and PHP). In Ubuntu 11.10 (based on Gnome 3), synaptic package manager has been removed so you can use Ubuntu Software Center or terminal (or install synaptic package manager in Ubuntu 11.10 (Oneiric Ocelot) if it’s you favorite application for managing application – although due to some major improvements in Ubuntu Software Center you might not need it anymore). In Ubuntu or any other Linux based systems there are lot of other database programs are also available such as SQLite, mongoDB, H2, CouchDB, etc but MySQL is probably the most reliable, fast and powerful database – although it depends on the type of application or your interest. I prefer Terminal for managing applications, as I think it’s very handy, although installing new softwares/Apps from Software center is also very simple – just search for the mysql server meta package (if you don’t know the actual name of the package then search using name of equivalent proprietary software, e.g if you search for Photoshop then you will get GIMP) which will automatically select the latest version and click on Install button….and wait for the download/installation procedure to finish and you’re done! 2. 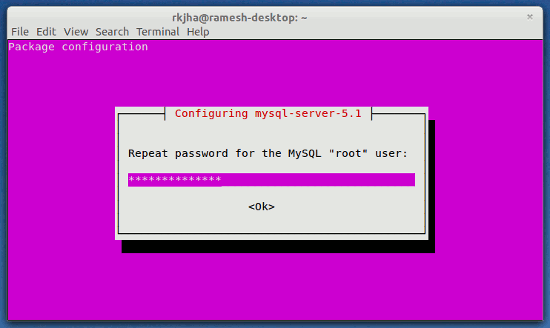 During the installation process – you will be prompted to set the password for root user (for MySQL server). Then, enter the password again (for confirmation) and the installation process will complete within a minute. 3. That’s All..you’re successfully installed the mysql server, client and other dependent packages successfully. 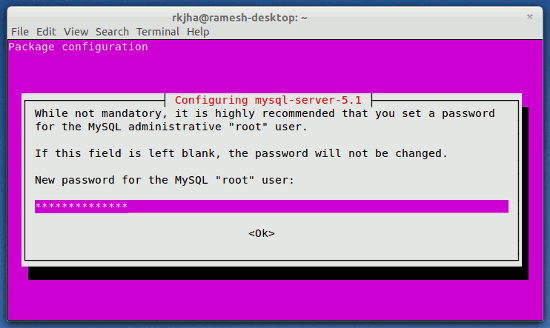 Then enter your root password (you entered during installation – step#2 ) and you will get the mysql prompt. phpMyAdmin is a MySQL web administration tool, which allow us to administrate MySQL database in graphical interface (from your browser) and available for Ubuntu 11.04 (natty narwhal) or 10.10 (Maverick Meerkat) or 10.04 (Lucid Lynx) or any other Linux distros. 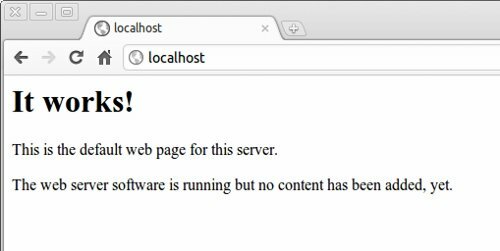 Since phpMyAdmin is written in PHP (Hypertext Preprocessor (Surprised! it’s a recursive acronym), The most popular scripting language, used for server side processing); of course it’s an open source (and Free!) and cross platform application, so you can also use it on Windows NT based operating system such as Windows XP or 7; or Mac OS X.
phpMyAdmin is specially useful for beginners because it allows them to create, modify, delete or update – tables, field and rows, users permissions and settings etc in much simpler (as compared to command line interface) way. 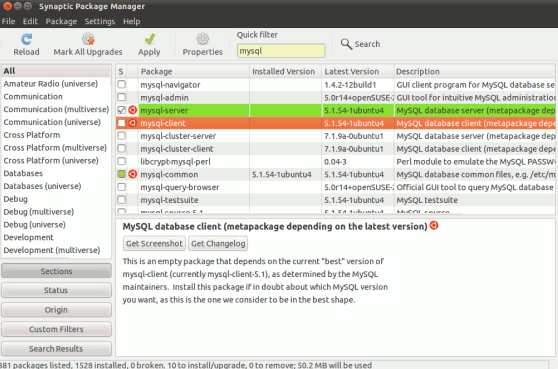 For Ubuntu phpmyadmin is the best (probably) tool for managing and controlling MySQL database. 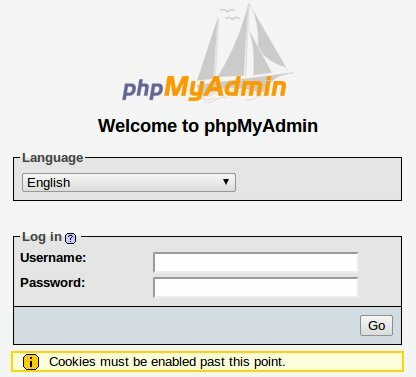 What You can do with phpMyAdmin ? Alternative Method : Open Synaptic package manager, search for ‘phpmyadmin’, check the box for installation and click on Apply button (don’t forget to select yes for dependencies, I mean dependent libraries or program) to install the selected programs. That’s all..Now you are ready to rock with phpMyAdmin. MySQL is the most popular database, mostly used in developing database driven websites or in other words web Applications (Web Apps or Apps). it’s Free and open source. MySQL is a Relational Database Management System (RDBMS), that runs like a server and serves the requests (usually CRUD (Create, Retrieve, Update, Delete) operations) from the clients. On Ubuntu 11.04 (Alias : Natty Narwhal) , if you want to use any database server, then of course MySQL is the best choice. This post will guide you in installing MySQL server/client (current version : 5.1) from Synaptic Package Manager or Command Line. 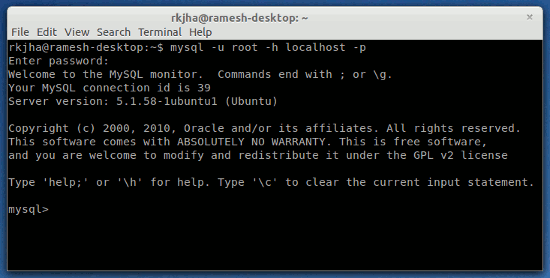 In last I’ll also show you, how to connect to the MySQL database at the Terminal/shell, although you can also install use graphical tool to manage MySQL database – e.g MySQL Query Browser, MySQL Administrator or phpMyAdmin. MySQL is very popular in the combination of : LAMP – Linux, Apache, MySQL and PHP. #1 : Open Synaptic Package Manager and search for ‘mysql’. Then select (check the box) the mysql server 5.1 to install. If you want to install some other packages, then click on yes, if it asks for dependencies. #2 : Then click on Apply and wait for the installation to complete. 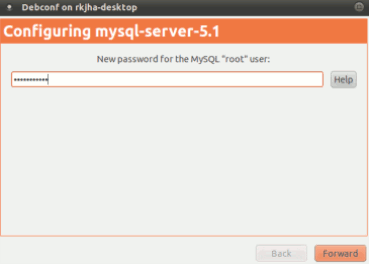 #3 : In the , middle of the installation you will be prompted to Enter the MySQL ROOT Password. Enter a good password for that, but remember!, you need this password to manage the MySQL databases and users, so don’t forget!! #4 : Relax, until the installation is complete. Then Enter your Password (ROOT Password, that you entered in step #3) to connect to the server running at localhost.